Behold the Street Fighter®25th Anniversary Collector’s Set! 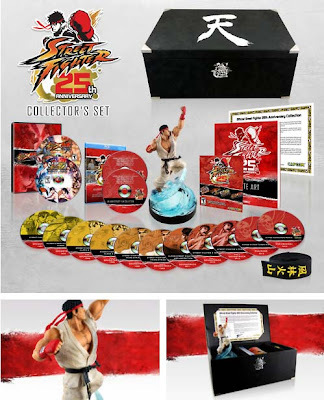 This limited edition set is a must-have for any Street Fighter® video game aficionado. Packed with Street Fighter® video games, artwork, videos, music and exclusive collectibles all encased in a specially created chest complete with a certificate of authenticity! Past and Present Street Fighter® Games – Playable on current gen Xbox 360 console systems, the four critically-acclaimed titles selected from the star-studded catalog are: Super Street Fighter® II Turbo HD Remix, Street Fighter® III 3rd Strike Online Edition, Super Street Fighter® IV Arcade Edition with all costume DLC and Street Fighter® X Tekken® including all character and Swap Costume DLC. Exclusive Video – The two-disc Blu-Ray set includes a documentary that highlights the profound influence the franchise has had on fans - and vice versa - throughout the years. The collection of videos also includes Street Fighter®IV and Super Street Fighter®IV Anime movies as well as all episodes of the Street Fighter® animated series and Street Fighter®II: The Animated Movie. Light-up Ryu Statue – A specially commissioned and highly-detailed collectable Ryu statue stands prominently at 8” tall and features the iconic character in mid-Shoryuken, with flames lit from below. 11-Disc Soundtrack – Street Fighter® game music spanning the past 25 years, in addition to remixes and fan-created music inspired by past Street Fighter® games. 64-page Hardcover Art Book – A tribute to Street Fighter® game fans from all over the world, the art book includes fan pieces submitted by professional and aspiring artists alike. Ryu’s Belt – Created to regulation specs, the full-size martial arts black belt is a replica of the one Ryu wears and even includes his classic "Fūrinkazan" in kanji! Certificate of Authenticity – Each Collector’s Set comes individually numbered complete with a certificate of authenticity. Linkin Park "BURN IT DOWN"